This is a paper I wrote for my neuroscience class and I thought it’s worth sharing on my blog. I’ve been studying beauty for a while now and I tried to do a quick overview of a lot of the research which is taking place today, placing it in all in a larger context. However, I really struggled writing this. I only had ten pages (double spaced) to work with. I could barely even scratch the surface with that. I will be on Christmas break here soon, so I plan to write some more posts on beauty and why the subject has been of interest to me lately. I’ll be able to get into more depth and detail then. Throughout the tradition of western thought, truth, goodness, and beauty are three terms which are always discussed together. The world is delineated into the polarities of true and false, good and evil, and the beautiful and ugly. Truth finds itself in the spheres of thought and logic, goodness resides in actions and morals, and we are to enjoy beauty in aesthetic works. That is not to say these regimes are isolated from one another. Moral treatises discuss the spiritual beauty of a noble man with a virtuous character, scientists find an ineffable beauty in the structure and order of the universe, and poets attempt to crystallize beauty in a scene, in a face, or in a deed. There is certainly an overlap in these ideas, and they are difficult to untangle; beauty in particular is a very difficult concept to pin down. If beauty is entirely subjective, if it is simply adherence to the arbitrary customs of a particular time and place, then it is not something that can be defined. On the other hand, if it is objective, if it is something immediately apparent to any observer like other simple sensible qualities, then why is so much discussion required to sharpen our perception of it? The truth seems to lie somewhere inbetween, and whatever beauty is, it always seems to escape rigid definition. Despite these difficulties, modern science is attempting to shed new light on very old questions in the relatively new and rapidly growing field of neuroaesthetics. This discipline uses neuroscience to explain and understand aesthetic experiences at the neurological level. Using cognitive models, sophisticated brain scanners, and evolutionary theory, these neuroscientists are finally making some headway in the formerly intractable domain of the philosophy of beauty, though their progress is limited and there is a long way to go. If one carefully looks through the literature, a reader will see that aesthetic judgments rely on a vast interplay of many different factors. Most research relates to the visual aesthetics of images, such as paintings or computer graphics, but there is also significant work dealing with music as well. The field has slowly been developing and adhering to an aesthetic model (Leder 2004) which captures the key processes of aesthetic experience, and while it mostly pertains to visual imagery, it can also be applied to other areas as well. This model (Figure 1) is useful in providing a general framework by which to organize the discussion in this text, though it must be noted that many important works in this field pay no mind to this model. This text will highlight a handful of studies which fit within the model and then move to some which do not. Looking at the top of the model, the reader will see that every aesthetic experience happens within a certain context. If a person is told they are looking at a work of art, this will put the brain in a certain aesthetic orientation, and research has shown (Cupchik, Vartanian, Crawley, and Mikulis 2009) that his brain will process the information differently than it would have otherwise. When in an aesthetic orientation, brain scans reveal a much higher activation in anterior prefrontal regions. When not in this frame of mind, the brain processes the image almost entirely in occipital regions, related to perceptual processing. An aesthetic attitude primes the mind, creating an expectation of pleasure which heavily influences the intensity of pleasure experienced by the viewer (Kirk, Skov, Hulme, Christensen, and Zeki 2009). This effect can be very powerful. For example, if you present images of a beautiful city to people, yet tell them that the area of town is known for its terrible crime rate, they will rate the images and the people they see in them with a much lower beauty score than if you tell them it is a peaceful place which is wonderful to raise children (Leder et al. 2010). Many aesthetic theories try to explain the various aspects of aesthetic perception by carefully analyzing the different stages of the perceptual process, and this is illustrated in the beginning stages of Leder’s model. For example, you can place colored shapes onto different colored backgrounds and ask people to rate the appearance. Research has shown that a strong contrast between the shape and the background is preferred (Reber, Winkielman, and Schwarz 1998). Why? These researchers say it is due to an idea called processing fluency. Basically, the brain is a lazy instrument and the more easily it can process an object, the more it will reward the person. They claim this also explains why we humans like things to be symmetric; symmetric objects are easier to process. It sounds plausible, but other research indicates that it cannot be the entire picture. If you show a person complex nature images but meddle with the contrast, you can change the image’s beauty rating without changing its processing fluency (Tinio and Leder 2009); contrast was found to have no impact on how quickly participants could identify the displayed images’ contents. Also, if the brain preferred to experience the same thing over and over, boredom would not exist. So this gets rather complicated. The brain seems to like things it is comfortable and familiar with, but it also craves new information and experiences. This has led researchers (Biederman and Vessel 2006) to propose models as to why people crave new experiences and grow tired of familiar experiences with repeated exposure. It is claimed this is due to the distribution of mu-opioid receptors in the brain and competitive learning. The density of opioid receptors increases as you reach deeper levels in cortical processing and repetition weakens the amount of positive stimulation. Their hypothesis proposes that the rate of endomorphin release in parahippocampal cortex determines, at least partially, our human preference for experiences that are both novel (because they are yet to undergo competitive learning) as well as those open to many interpretations (because such patterns would initially activate, through associations, many dense regions of mu-opioid receptors). There is evidence to support this point of view as well. For example, many music listeners report experiencing “chills” while listening to certain stirring pieces of music. If you give them the drug naloxone (Goldstein 1980), a mu-opiod antagonist that prevents endorphins from binding to these receptors, the chills disappear. There is a lot of debate in this area. Other researchers are avoiding the use of complicated models to explain beauty. One experiment (Ishizu, T. & Zeki, S. 2011) had subjects look at pictures of paintings and listen to musical excerpts and then rate them on a scale of 1-9, with 9 being the most beautiful. Three sets of stimuli were created from these ratings – beautiful, indifferent, and ugly – and the subjects viewed and listened to these stimuli while being scanned by an fMRI machine. The results showed that while several areas were active during this process, only one cortical area, located in medial orbito-frontal cortex (mOFC), was active during the experience of both musical and visual beauty. They found that the more activation present in the mOFC, the stronger the reported intensity of the experience of beauty. Studies judging human sexual attraction report similar results (Ishai, A. 2007). Herero- and homosexual men and women were asked to evaluate the attractiveness of human faces. In heterosexual women and homosexual men, attractive male faces elicited stronger activation in their mOFCs than attractive female faces, whereas in heterosexual men and homosexual women, attractive female faces evoked stronger activation than attractive male faces. These approaches are valuable in that they tell us which area of the brain is responsible for our subjective sense of beauty, but they do not bring us closer to understanding what beauty is or why some things are judged beautiful and other things are not. It is also possible to explain some aspects of our sense of beauty using evolutionary explanations, though it is difficult to find a clear evolutionary purpose for our aesthetic appreciation of art and music. If we want to argue that that an aesthetic appreciation is biologically ingrained in all human beings, these claims must be proven to be independent of any particular culture. This is difficult to achieve, however, there are studies which have demonstrated cross cultural aesthetic stimuli which are appreciated regardless of culture. Research has shown (Orians and Heerwagen, 1992) that nearly all children, regardless of their race, gender, or culture, are drawn to nature images which resemble the East African landscapes in which our species evolved. These images feature savannahs with a variety of open wooded spaces (for living and hiding), a body of water (for drinking), and trees with low hanging branches (for gathering fruit and escaping). This preference seems to be ingrained in most of us, and these preferred landscapes are found all over in calendars, screensavers, and murals worldwide (Dutton 2003). As a person grows older, they may think of all the mosquitoes, the crocodiles, and other dangers in that landscape, and all of these sorts of things may change their subjective preferences for a particular environment over another; but humans seem to be born with a default appreciation for East African landscapes. However, it is important to keep in mind that while this idea is plausible, these sorts of explanations fall victim to the same difficulties all evolutionary explanations do. No matter what theory you have, you can always make up an evolutionary reason why such and such must be the case. Why do people cooperate? That supposedly helps contribute to gene perpetuation. Why do people fight? It means their genes perpetuate and not somebody else’s. So do we like savannahs because they are where we evolved? Maybe, but it could be something else entirely. There are also neuroscientists attempting to explain our appreciation for abstract art using evolutionary ideas (Ramachandran and Hirstein, 1999). The authors introduce eight laws of aesthetic experience, a set of heuristics artists either consciously or unconsciously use to optimally stimulate the visual areas of the brain. One such law is called the peak shift phenomenon, a neuroaesthetic principle which states that if an organism is instinctually or conditionally trained to respond to a stimulus, it will respond even more intensely to extreme versions of the stimulus. For example, it is well known that if a rat is taught to discriminate a square from a rectangle then rewarded for the rectangle, it will respond even more intensely if it is shown a longer and skinner rectangle. But what does this have to do with aesthetics? 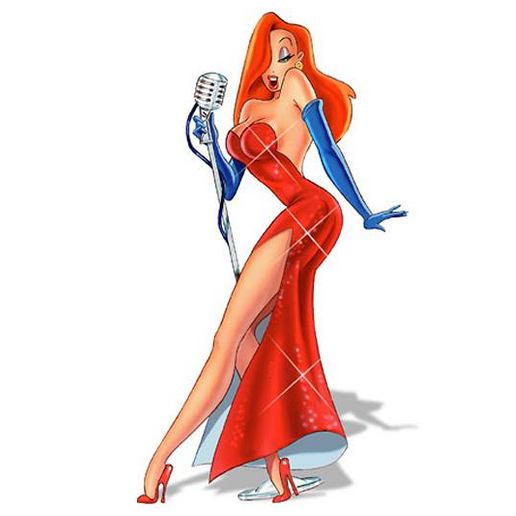 Take the highly sexualized cartoon character Jessica Rabbit from the popular movie Who Framed Roger Rabbit. What is it about how she is drawn that makes her so sexual? Jessica is a caricature of the female form which has been highly amplified. To make a figure like hers, you start with a normal woman’s body and then subtract away the average of all human bodies. This leaves you with an essence of the female form, the perceptual differences that make a female’s body female. Then you take this essence and amplify it into a distorted caricature. If a person is attracted to females, their mind will respond to this caricature in the same way the rat does to longer, skinnier rectangles. These ideas are informed speculation and it would be interesting to investigate whether the mOFCs of those attracted to women would be highly stimulated by Jessica Rabbit animations, even more so than realistic female forms. This text only briefly highlights a few studies in a very new and exciting field. Neuroscientists are slowly building a model of the aesthetic process, but considering the infancy of neuroaesthetics, research is still all over the place. Most ongoing research deals with visual imagery and music. Many different plausible ideas are being proposed to explain different aesthetic experiences, but in general, there are disagreements, even when it comes to simple things like why we like one colored shape as opposed to another. Some researchers, like Zeki, choose to define beauty not in terms of a complicated model, but in the strength of activation within the medial orbito-frontal cortex (mOFC). While this may be the best we can do for now, overall it is unsatisfactory. What we want are general principles of aesthetic perception, similar to Ramachandran’s eight laws of aesthetics. Even so, we are a long way from arriving at a complete list of these principles and we have not even begun to tackle tougher issues, such as moral beauty or why a physicist finds a mathematical equation beautiful. Still, it is refreshing any progress is being made at all. Questions of beauty are as old civilization itself and little progress has been made since the ancient Greeks. As technology allows us to probe the minute details of the brain, we’re sure to uncover what the mOFC and other brain areas are doing along with the general aesthetic principles behind how they operates. Biederman, I., & Vessel, E. A. (2006). Perceptual pleasure and the brain. American Scientist, 95, 249 –255. Cupchik, G. C., Vartanian, O., Crawley, A., & Mikulis, D. J. (2009). Viewing artworks: Contributions of cognitive control and perceptual facilitation to aesthetic experience. Brain and Cognition, 70, 84 –91. Dutton D (2003) Aesthetics and evolutionary psychology. In: The oxford handbook for aesthetics (Levinson J., ed), pp 693-705. Oxford: Oxford University Press. Goldstein, A. 1980. Thrills in response to music and other stimuli. Physiological Psychology 8:126-129. Ishizu, T. & Zeki, S. (2011) Toward a brain-based theory of beauty. PLoS ONE, 6, e21852. Kirk, U., Skov, M., Hulme, O., Christensen, M. S., & Zeki, S. (2009). Modulation of aesthetic value by semantic context: An fMRI study. NeuroImage, 44, 1125–1132. Leder, H., Belke, B., Oeberst, A., & Augustin, D. (2004). A model of aesthetic appreciation and aesthetic judgments. British Journal of Psychology, 95, 489 –508. Leder, H., Tinio, P. P. L., Fuchs, I. M., & Bohrn, I. (2010). When attractiveness demands longer looks: The effects of situation and gender. The Quarterly Journal of Experimental Psychology, 63, 1858 –1871. Orians G, Heerwagen J. Evolved responses to landscapes. The adapted mind: Evolutionary psychology and the generation of culture [e-book]. New York, NY, US: Oxford University Press; 1992:555-579. Ramachandran VS, Hirstein W (1999) The science of art: A neurological theory of aesthetic experience, J of Consc Stud 6:6-7. Reber, R., Schwarz, N., & Winkielman, P. (2004). Processing fluency and aesthetic pleasure: Is beauty in the perceiver’s processing experience? Personality and Social Psychology Review, 8, 364 –382. Tinio, P. P. L., & Leder, H. (2009). Just how stable are stable aesthetic features? Symmetry, complexity, and the jaws of massive familiarization. Acta Psychologica, 130, 241–250.